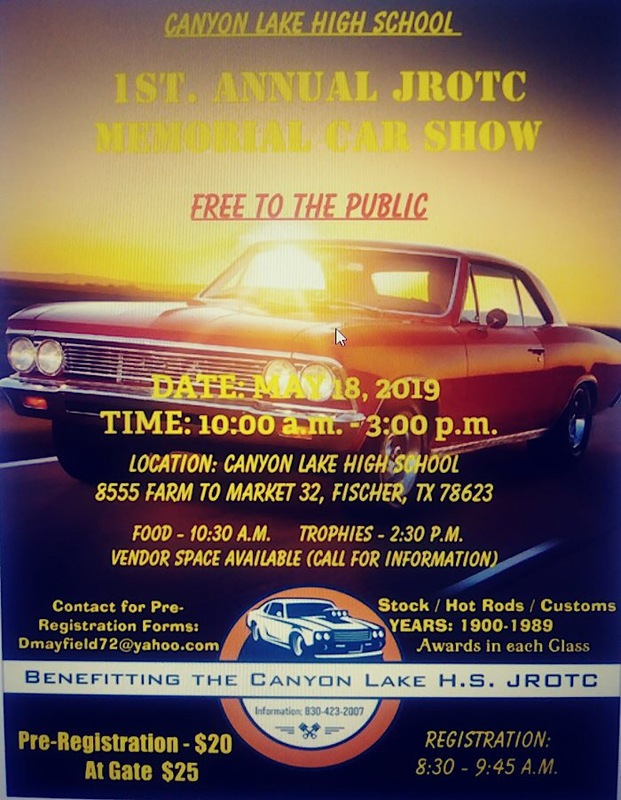 Canyon Lake High School J.R.O.T.C. Booster club will be hosting our 1st Benefit classic car show to raise money for our local J.R.O.T.C program. This event will be organized by the cadets. Funds raised by this event will go to supporting multiple programs sponsored by the J.R.O.T.C. including Veterans Memorial and Tribute ceremony and luncheon, honoring local veterans and their families, Build a Ramp program for local disabled vets, Memorial Day ceremonies in conjunction with the VFW and the Adopt a Highway program. Also, moneys raised also go towards leadership programs for the cadets, including Orienteering competition, Rifle team, Raider Challenge competition, leadership conferences and the yearend Awards Ceremony, which honors all the cadet’s hard work and efforts throughout the year. This is a grand event in which the cadets look forward to all year. All these programs contribute to the development of discipline and leadership skills of each cadet. FOR REGISTRATION : Email Dmayfield72@yahoo.com for Registration form.